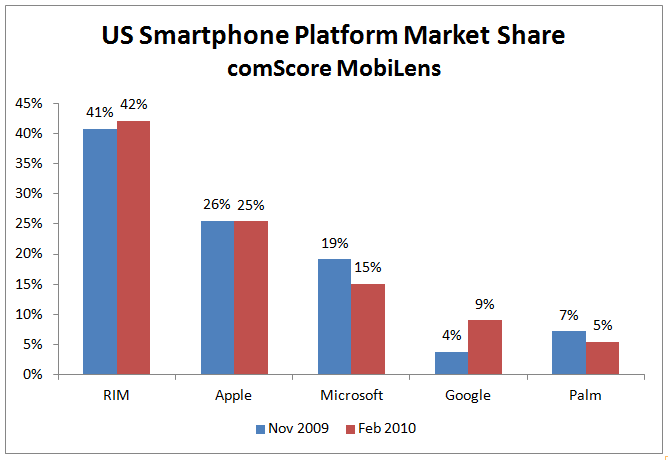 AdMob has just published a report comparing smartphone platforms from November 2009 and February 2010. As expected, Android has shown the most growth, almost doubling its market share in 3 months (most likely thanks to the Moto DROID). Windows Mobile continues to lose share, and Palm is also showing signs of distress. The Blackberry and iPhone remain largely unchanged. CompanionLink offers sync solutions for all five of the platforms mentioned. No matter what device you choose, you can rest assured that CompanionLink will help you sync your data from the desktop. More information about CompanionLink’s sync solutions can be found at www.companionlink.com. This entry was posted in News and tagged android, blackberry, device usage, iphone, outlook sync, palm webos, smartphones, windows mobile by Andy Sheragy. Bookmark the permalink.